A Complete Guide to Creating and Running a YouTube Channel 2017. This is everything you need to start your YouTube account, we would advise you bookmark this site to refer back to as you create your own Channel YouTube account. We include screenshots and step by step instruction. Please share with any other friends and family who also want to start their own youtube channel. You can click on any of the headings on the table of contents below ‘The Good Stuff’ to take you directly to the info you need. 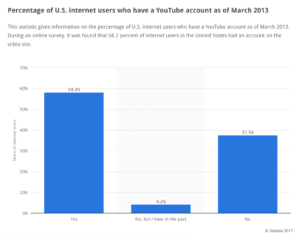 A Lot, most internet users have a YouTube account even if they don’t use it. According to a US-based statistics portal, in 2013, close to 60 percent of internet users in the States had an account on the video sharing platform ie YouTube. You can only imagine how that number has increased in these three years, and will increase as we move forward in 2017. Although there are other sites such as Vimeo and Dailymotion, the ease of use that YouTube provides has made it the destination for people who are looking for entertainment (vlogs, music videos, comedy sketches, movies) or information (tutorial videos, news, current affairs, world affairs) among other things. There are mainly two types of YouTube users – one who watch videos and other who create and share them. This article is about how you can become the latter and how to start your own youtube channel. Internet sensations like PewDiePie and iiSuperwomanii fall in this category. Forbes’ ranking of the 12 highest-earning YouTube stars shows they collectively earned £55m in the past 12 months, an increase of 23% on last year. And, I wouldn’t be surprised if even you are thinking of creating your own channel and beginning your journey to 2017 internet stardom. It’s something that we have all thought of sometime in our lives, yet stayed back due to lack of either motivation or the knowledge of where to start. It is for this reason that we have prepared this comprehensive guide to creating a YouTube channel so that you can put your talent out there for people to appreciate and hit those Like and Subscribe buttons. How to create a YouTube Channel, first you need a Google account. 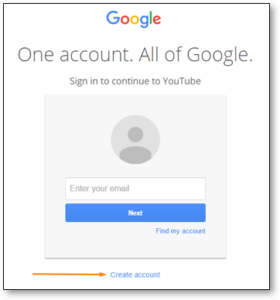 While you don’t need a Google account to watch YouTube videos, logging in with your Gmail ID would give you access to extra features on YouTube, like subscribing to your favorite YouTube channels and creating a watchlist. 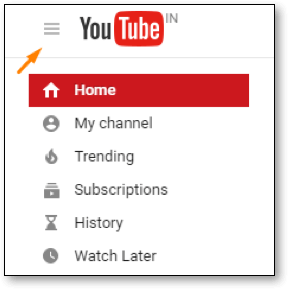 Things to know – Youtube is owned by Google – therefore your YouTube and Google accounts are completely connected, when setting up a YouTube account don’t get confused if you are asked to set up a google account as it is the same thing. Keep in mind that Google is the parent company, How does this affect you? It doesn’t, it is a little confusing at first but it will all be ok in the end. Tip: When creating a Google account, make sure you use your real name in the email ID. It wouldn’t be pragmatically right to use something like [email protected]. Use your first and last names and some numbers to create an ideal ID. E.g. : [email protected]. It is also best to avoid adding your year of birth. 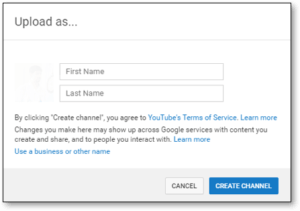 Once you have successfully created a Google account, the next step is to create a YouTube channel. Doing so will grant you the next level of rights such as uploading videos, commenting on them, and even creating playlists. Go to http://www.youtube.com/ and make sure you are signed-in with your Google email ID (this means sign into google first, and open YouTube on the same browser. Tip: Verifying your account will enable you to upload videos longer than 15 minutes. Since YouTube is home to a lot of spam videos, this step is highly recommended so that your account stays away from the blacklist. Once you have created a channel, you are automatically granted most of the basic features. You can upload, comment, create playlists, flag spam videos, and do a huge list of other stuff. But, as a vlogger, you need to set up your channel before you can start uploading videos. Nice..!!! Now you are ready to get started on personalising your channel, read the next chapter on create youtube channel art. We would really appreciate if you could share Vlogginghero.com with a friend who will also benefit from our site, we have put a lot of work and research to provide great info, sharing is a ranking factor for us, just as it is a ranking factor for your youtube channel.